Success! 'The Dude Abides' is completely roughed in and before the flakes fly! Well before the real lasting flakes anyway, we won't count that little Halloween hiccup. Riding from beginning to end would still be pretty challenging at this point, there is some difficult terrain on this trail and we still need to do some finish work; benching, rock work and line refinement once we can actually get some wheels on every section. Once it is entirely complete though it is going to be SWEET. 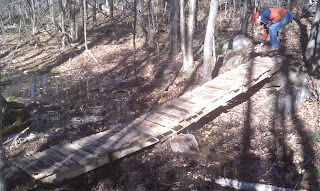 Not bad for our first full season of trail building at Page Hill. Bearclaw and Hardhat are already riding great and will only get better and The Dude Abides is looking like a challenge that will take at least a few seasons to completely crack...who will be the first to clean it all? We've already got the gears turning on more trails at Page Hill. I wouldn't be surprised if we get another trail or two flagged before all is said and done this year. We'll be ready to hit the ground running next Spring that is for sure!